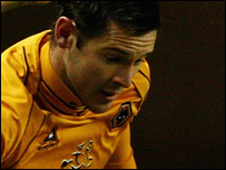 Wolves winger Matt Jarvis has signed a contract extension to stay at Molineux until 2012. Jarvis, 22, joined Wolves from Gillingham on an initial two-year contract in 2007 with a one-year option in the club's favour. Wolves had already indicated they were planning to take up the option, but now a two-year extension has been agreed. He said: "As soon as the possibility was there I was happy to get into the talks. I'm very happy here." "I enjoy playing for Wolves, the supporters have been very good to me and I just want to be part of things here for as long as I can," he continued. Wolves manager Mick McCarthy has said Jarvis has fought hard to prove himself after persistent injury problems. "He was a relative unknown when we signed him and then we didn't see him for a while because of his [hamstring] injury, and that's not easy when you go to a new club," he said. "He had to win everyone over but he's done that and is now an integral part of the team." Jarvis is the second Wolves player to agree an extended contract this week, after Andy Keogh also signed a deal running through until 2012.